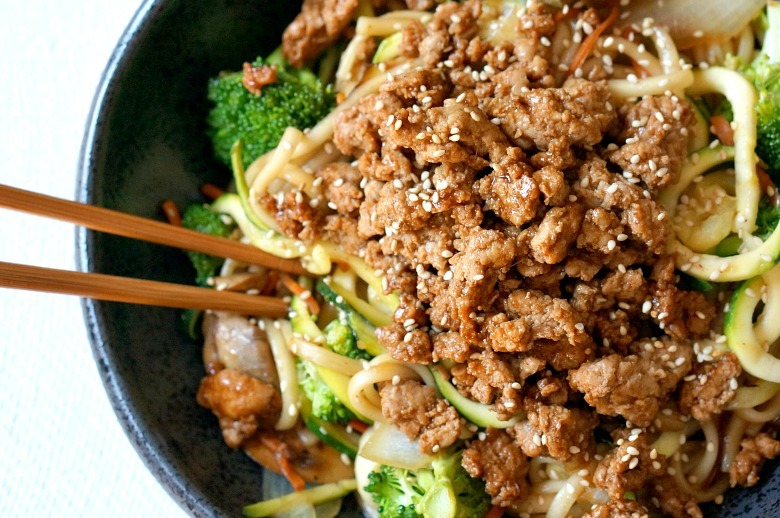 Turn your favorite Asian-inspired dinner into a cheap healthy meal at home with this Skinny Yaki Udon recipe. This budget-friendly, healthier classic is a 30-minute meal that gets an amazing flavor boost from the Homemade Sweet-Tangy Sauce. Your favorite Asian-inspired dinner just got skinny! If you’re watching your waistline, but you’re not willing to give up your favorite Asian-inspired dinners, this Skinny Yaki Udon recipe is for you! By making just a few simple swaps in the classic recipe, you get a lighter dish that doesn’t sacrifice on flavor. Not only is this a healthier classic, but it’s also a 30-minute meal that’s perfect for a busy weeknight dinner. What’s the secret to this cheap healthy meal? This healthier twist on the traditional Asian comfort food uses lean ground turkey instead of ground beef to greatly reduce the fat in the dish. To reduce the carbs, but still maintain that chewy udon noodle experience, you cut the carb-y noodles in half and substitute the other half with thick-cut zucchini noodles. By using Mazola® Corn Oil instead of extra virgin olive oil, you reduce the cholesterol in half! The recipe, as written, is amazing on its own, but you really don’t want to serve this dish without the secret sauce as it enhances the flavor ten fold without adding any unhealthy elements to your new favorite skinny dinner! Combine all of the sauce ingredients and set aside. Bring a large skillet to high heat. Add a drizzle of Mazola® Corn Oil and add the ground turkey. Cook, breaking up the meat as it cooks, until no pink remains. Drain and return to the skillet. Add in hoisin and 1 tbsp of soy sauce. Cook, stirring occasionally, until warmed through. Scoop the meat out into a bowl and cover to keep warm. Meanwhile, cook the udon noodles according to package directions. Drain, rinse with cold water, and toss with 1 tsp of Mazola® Corn Oil. Wipe out the skillet and return the skillet to high heat. Add 3 tbsp of oil to the skillet. Add the mushrooms and cook, stirring occasionally, until lightly browned (about 3 minutes). Add the carrots and onions, and cook, stirring once or twice, for another 2-3 minutes. Add the broccoli and cook until the broccoli just turns bright green. If the skillet appears dry, add in another tbsp of oil, then add in the udon noodles. Mix them into the veggies and allow the veggies and noodles to rest in the pan about 2 minutes prior to stirring again. Add in the zucchini noodles and the sauce. Continue cooking over high heat and stirring the ingredients until everything is piping hot and the noodles begin to caramelize just a touch. Remove from heat. To serve, portion out the noodles and veggies, then top with the turkey. Sprinkle with toasted sesame seeds if desired and enjoy immediately! Home Chef Tip: You can use whatever vegetables you have on hand for this dish. Cauliflower would be fantastic as well. Just make sure you adjust the cooking time depending on which vegetables you use. We hope you enjoy this Skinny Yaki Udon with Homemade Sweet-Tangy Sauce from Forks & Folly as much as we do. If you love this cheap healthy meal, you can find more like it by visiting our 30-Minute Meal Section. For daily recipe inspiration, subscribe to our newsletter, like us on Facebook, and follow us on Pinterest. Enjoy!